Practical work, examples, and interactive forms of teaching content will help you gain expertise in the field as well. The internet is your classroom, so it’s up to you to pick the right free digital marketing course and improve your knowledge. 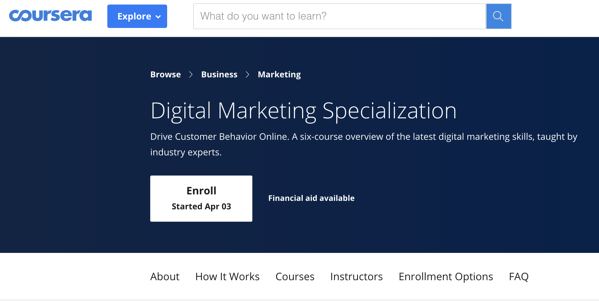 Here are 12 of our favorite online digital marketing courses. Udemy is known for its discounts for marketing courses and the Masterclass isn't an exception. Containing 23 courses, this package is one of the least expensive in the digital marketing world. One of the most important pointers of each course is the extensive coverage of mistakes you can make on social media. It's one of the best marketing courses devoted to the practical execution of marketing strategies. It truly prepares you for employment. Skillshare is an amazing hub for all things digital marketing. The courses are all free and give you an opportunity to change your career in mere months. While they don’t focus on analytics and basic strategies they teach marketers how to utilize content tools for workload reduction. It’s a course that prepares you for the future of digital marketing and teaches you lessons in basic accounting, too. If you’re looking for a truly versatile choice, this should be your pick. Marketing Profs gives you an excellent opportunity to learn the basics of marketing. There is no time lost in memorizing statistics and theoretical tidbits. Instead, the focus is on launching campaigns and achieving results with big clients almost instantly. Some knowledge would make it easier, but it’s still not overly challenging if you are willing to commit to the program. Each digital marketing niche has its dedicated section with a challenging end test. Once you pass each test, the certificate is yours. It’s one of the faster-paced courses, ideal for anyone who wants to cash in on their talent. If you haven’t noticed by now, HubSpot has an excellent blog that provides up-to-date and useful advice to businesses. In addition to that, they also have one of the best free digital marketing courses. During this program, you will learn how to actively analyze your target audience and become adept in other, less significant aspects of branding and promotion. There are even design basics included in this course. We love the fact that HubSpot created a course dedicated to creating an entire experience with marketing. A compelling choice for anyone looking to expand their digital marketing knowledge. One of Coursera’s most enticing offers, the Digital Marketing Specialization course is a splendid chance to receive professional training in all aspects of digital marketing. It contains everything a digital marketing course should have, from social network-specific data to data management. It’s a lengthy but amazingly helpful course that allows you to handle everything a small marketing agency can do, an ideal path to a job. This is a high-intensity course and our advice would be to take it when you have enough time and can truly focus on it. Other obligations will likely interfere with all the tests and things you have to learn. 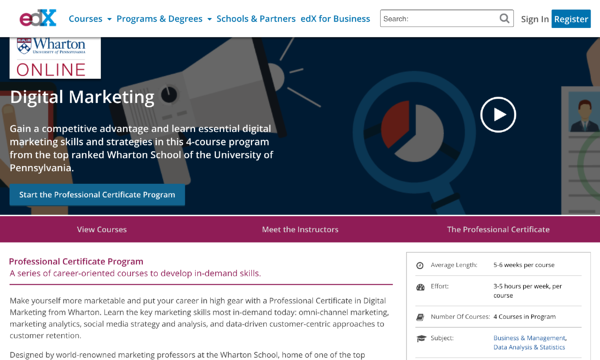 eDX offers a shorter program that caters to anyone interested in digital marketing. It doesn’t require much time to master it, making it ideal for college students. This entire section teaches marketers about automating most of their work. If you’re a college student, this 4-part digital marketing course is the best choice for your future career. There aren’t too many courses that focus on concise explanations. It’s refreshing to see a choice that involves support for beginners, as well as a fasted paced set of lessons. This is perhaps the most renowned digital marketing course today. Google has launched a free course, teaching users how to master their various marketing platforms. After you’ve passed the course, you can learn how to devise campaigns on platforms such as Google AdWords, Google Analytics and more. It’s a valid and recognized certificate that will boost your resume. It’s a little longer than most courses but worth it. The American Marketing Association or AMA has one of the best digital marketing courses available. It comes for free, in the form of frequently posted short blogs. The entire site is cleanly divided into sections, allowing even beginners to start from a point familiar to them. The topics covered include social media, web design basics, as well as some very valuable email marketing tricks. In every blog, you learn a mix of new and old tactics on how to survive in a competitive market. It offers a specialization in branding. This digital marketing cost is for those who are particularly interested in how to run a business or to be on the executive front. Alison Diploma in E-Business teaches valuable lessons about different markets and the ever-changing ways on how to reach each area. There aren't many courses which provide such clear and crisp advice for handling losses in revenue and low marketing budgets. Most other digital marketing programs focus on success strategies and not on facing problems. Even the more experienced marketing experts can learn something from this course. Another thing we like is the ideal ratio between theoretical advice and detailed examples. The hub of all things business, LinkedIn has an extensive marketing network. 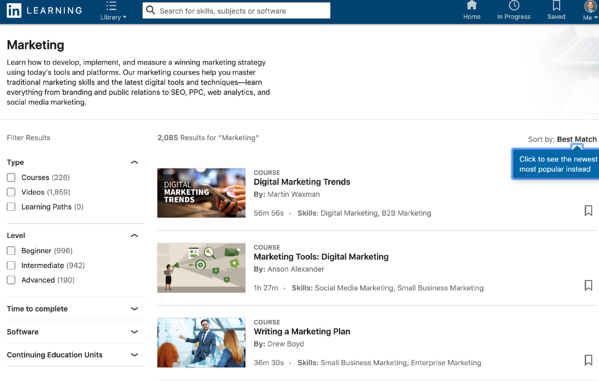 If you want to succeed in B2B marketing, recruitment or anything else that involves collaboration, LinkedIn should be the first thing on your agenda. In this digital marketing course, you get everything you need in terms of knowledge about reaching other businesses. Before you launch a startup or a project, it’s important to know how to find sponsors and close deals. The second HubSpot on this list relates more to inbound marketing. It teaches you how to handle changes in customer interest. There are sections for content writing, proofreading and the use of various marketing tools. It has everything you need to know about how to handle social media campaigns or any informative, SEO-fit content. In some lessons, you even have advice on which tone to use for medical writing, legal writing, and other niches. PPC marketing might be the most confusing aspect of digital marketing. WordStream handles the subject masterfully and delivers knowledge straight from real market experience. There are separate parts of the course that test your critical thinking and pose theoretical problems. It’s a digital marketing course that challenges you and gives you an opportunity to get used to real conditions. Before you’re ready to conquer the marketing industry, you need practical experience. The best online marketing courses provide you with excellent examples of some of the challenges you’ll face. Save yourself some valuable time and don’t pick up marketing as a major. You can still pursue something else you love and learn how to market, for free and in a much shorter time period. Options like the Google Digital Marketing Course are ideal for adding valuable certificates to your resume. Online digital marketing courses have become an important way for people to earn money, even from the comfort of their home. Work hard, utilize the right digital marketing course and you will find success in prosperity. What are the top digital marketing eLearning programs? Author Bio: Robert Everett is a freelance digital marketing consultant. His work includes working with globally active brands, like essay writing service EduBirdie and other writing tools. to improve their campaigns and content strategies. He creates several successful campaigns and similar tools to enhance content creation and engage followers. A simple way to get caught up on digital marketing. The top B2B digital marketing strategies and tools in one ebook.